Measles is the latest episode in the long-running hit program called Medical Madness. Don’t get me wrong; measles is a nasty disease and warrants thoughtful consideration. Actually, that is part of my problem with what has been going on; the “thoughtful” is entirely absent. There is little, if any, dialogue, and precious little thought in evidence. As the people generating the biggest buzz are most often politicians or media commentators, it should not be surprising that they have no grasp of the complex issues involved. With apologies to Rand Paul, ophthalmologists should also be forgiven for not knowing much about vaccines. At the other end of the spectrum, studying this issue for 35 years, while treating sick patients and personally administering vaccines myself, I know a great deal more. However, that knowledge does not grant me certainty. Instead, my knowledge is the main reason I am not 100% certain. My goal now is to generate some uncertainty in your own mind. Uncertainty, a bit of ambivalence, is healthy. It is vital in the face of a growing push for extreme responses. There is a proposal in California to eliminate personal choice vaccine waivers, supported by both of our senators and our governor. The UC college system is mandating a wide range of vaccinations for all incoming freshman as of 2017 (MMR, tetanus, chicken pox, meningitis, pertussis – aka, whooping cough). I have no problem with people deciding either to vaccinate or not vaccinate. I do have problems with reactionary, knee-jerk decisions and the conviction of some under-informed or biased individuals, that they should make decisions for everyone else. 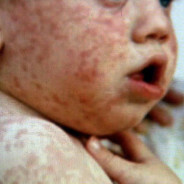 Measles (rubeola) is one of the “childhood” diseases medicine has been trying to prevent with vaccinations. Children with measles develop cough, runny nose, irritated eyes, a high fever (104) and a rash. The two worst complications are pneumonia and inflammation of the brain. In parts of the world where children are sickly because of malnutrition, measles is a big killer. Measles is a “childhood” disease because everyone used to catch it during childhood. It was so common that your driver’s license can be proof of immunity. Officially, anyone born before 1957 is immune to measles. Statistics are often misleading, and never more so than when they are about an illness so common that reporting it seemed like too much of a bother. Before the measles vaccination program was rolled out in 1963, in America we had approximately 500,000 cases of measles reported every year and 400 – 500 deaths from measles (usually pneumonia). So, you will see death rates from measles reported as 0.1% (aka 1/1000). Those numbers indicate that the death rate from measles is 10 times less than is widely quoted. How Deadly Is Measles Compared To Other Diseases? Although even ONE death is scary, some perspective is necessary. 9,000 children die every year from accidents. Roughly 350 die each year from diarrhea. What about vaccine-related diseases? In the past, whooping cough used to cause 9,000 deaths a year in the US. Polio paralyzed 2,000 – 40,000 a year, but that was less than 1% of those who caught polio. Most experienced minimal symptoms. My polio experiences include summertime memories of swimming pool closures due to polio outbreaks, friends who were partially paralyzed from the disease and working in a hospital where we still had a few patients living in “iron lungs”. How Common Is Measles Now? Measles cases occur all over the world. The hot spot these days is the Western Pacific, where there were nearly 200,000 cases in 2014. That sounds like a lot, but compared to the numbers I recounted earlier, that’s much less than we had in the USA alone 50-60 years ago. Over the last 15 years the number of measles cases in the USA has ranged from 60 – 644 annually. The numbers vary because measles is so highly contagious. There will be a flurry of cases over a short time and then none until the next regional epidemic pops out. The Disneyland outbreak is waning. So far there have been 123 cases, with the majority of those in California. It is early in the year, but 123 cases puts 2015 as only the fifth highest in the last 15 years. In 2011 there were 222 measles cases. In 2014 an outbreak in an Amish community in Ohio sickened almost 400 children, reaching 664 cases nationwide. One should be asking why there is such a panic this year. Over 20 years ago at a hospital staff meeting, one of our agenda items was discussion of a new hospital regulation mandating routine Hepatitis vaccine for all newborns. In response to the announcement, a local conventional physician blurted out: “I’m glad I’m not having any more kids”. At a large conventional medical conference 15 years ago, a presenter asked us to raise our hands for each vaccination we recommended. Less than 1/3 of the docs recommended all the vaccines we were officially supposed to recommend. The list seemed too long to most of us. The list of recommended immunizations has gotten much longer. The CDC pediatric vaccination schedule currently recommends no less than 31 shots by the time a child reaches 18. Some of those shots contain three different immunizations, kindly limiting the needle pokes. Unfortunately, despite this increase, medical skepticism has declined. Instead, when parents refuse to fully vaccinate their children, many physicians now kick the families out of their practice. Vaccines pretty much always contain substances that sound poisonous or , in some way, appalling (see also this and this and this). Among the ingredients in the MMR vaccine are chicken embryo, genetically engineered human blood protein and lung cells from human fetuses. These worrisome-sounding ingredients are present in very small doses, possibly making them safe. Then again, I would rather not have them injected into my body, IF possible. Could these ingredients create problems for some of us? It is hard to deny that possibility entirely. Might immunizations cause problems that we don’t recognize? Yes, that is possible, even likely. Rare reactions, delayed reactions, and complex, unanticipated consequences are very difficult to identify. In recent years we have identified some rare adverse effects that we never knew about before. One example is the recent recognition that MMR vaccine (Measles – Mumps – Rubella) can rarely cause a bleeding disorder (1 case/30,000 doses) and a brain inflammation called encephalitis (1 case in one million). Twenty year ago the Japanese dropped the MMR vaccine they were using. Too many children were having bad reactions – more than one in 1,000. The problems with that vaccine were apparently due to the mumps component. The same problematic MMR vaccine had been used and dropped in Britain. Since then Britain moved to a different MMR, and the Japanese government does not require MMR, instead encouraging vaccination with each component separately. (That option is not available in the US). Measles strikes very young children the hardest. Ironically, the measles vaccine has made the most vulnerable, those under age 1, more vulnerable to measles. How is that? When a girl catches measles, she develops her own natural immunity. Then, when she grows up, has a baby and nurses the baby, that baby is protected from measles by his mother’s immunity. The breast milk of a woman who got her immunity to measles from a vaccine does not protect her baby. Some of the worst measles cases have been caused by this immunity gap that was created by the vaccination program. Very few if any of those infants would have gotten sick in the past. The possible link between autism and immunization has fueled much of the debate about measles vaccination. That is too simplistic. My patients have been questioning vaccines long before the Andrew Wakefield saga. Is there proof that autism is caused by vaccinations? No. Is there a biologically plausible link between autism and vaccinations? Yes. People with autism have what is called neuro-inflammation. I won’t go into the biochemical pathways, except to say the they are the pathways that detoxify metals, like those in our environment and now, less so, in vaccines. So, do we know what causes autism? No. This disordered biochemistry could be a consequence of the disease, not a cause. It is unlikely, although possible, that there is no connection between this biochemical disorder and the symptoms of autism. However, if your brain is already vulnerable, with only limited capacity for detoxifying metals, it is not a good idea to challenge it by exposure to more of the toxin. If the metal preservatives in vaccinations have been the most significant factor in the rise of autism, the rate of autism should be starting to fall because they were nearly eliminated several years ago. My belief, which is increasingly confirmed by research, is that environmental factors are causing autism. Furthermore, it is my belief that the most likely environmental factors are chemical toxins, and probably not infections. The other environmental factor which might be a significant risk for autism is Vitamin D levels, most likely by making children more vulnerable. At one point many were afraid that Sudden Infant Death Syndrome (SIDS) was caused by vaccines. After the cause of most cases of SIDS was discovered, that vaccine worry fell by the wayside. What was the cause? Although it wasn’t vaccinations, the medical profession (including yours truly) gave advice which did contribute to SIDS deaths. We told parents that their infants should sleep on their stomachs. That did prevent choking on their stomach contents, but it also caused many cases of SIDS. The point is that when you see something bad taking place, but you don’t know why, it is natural, rational and wise to become extremely cautious. It is also abundantly obvious that we should be skeptical of experts who gush blithe reassurances when they can’t explain the problem. If someone tells you that everything is going to be fine, but they have no idea what is wrong, why would you believe them? Lack of understanding = lack of trust. Achieving “herd immunity” requires vaccinating as many individuals as possible. The point of herd immunity is that if enough people are immune to a disease, that disease can’t spread. Pretty much true, at least in theory. Right now, in a suburb of Sacramento, there is an outbreak of whooping cough (aka, pertussis). The problem there is not under-vaccination. Over 98% of the preschoolers, the group most likely to spread the disease, are properly vaccinated for whooping cough. The vaccine is not working, and some data suggest that those who have been vaccinated might be more likely to get sick. Like whooping cough, measles is so contagious that you need over 95% vaccination coverage to stop it. Herd immunity also teaches us that vaccines protect populations, not individuals. A person who gets vaccinated is usually less likely to catch that disease than someone who hasn’t been vaccinated. However, vaccination is not a guarantee of immunity. It is not unusual to find that the majority of individuals who get sick have been fully vaccinated. Even if a vaccine is perfect, viruses want to live. So they change if they can, making the old vaccines ineffective. This appears not to be a problem with measles, though. Some argue that they have the right to force you to vaccinate your children, no matter what concerns you have about vaccinations, because of the risks to their children and to society. There are many, many people who are so terrified about their own health and that of their children, that they take antibiotics for illnesses when they don’t really need to. The consequence of those needless antibiotic prescriptions, for all of us, is bacterial resistance. The bacteria evolve so that the antibiotics don’t kill them. The bacteria somehow know this is so vital to their survival that antibiotic resistance is passed on and on and on through 50 generations of bacteria. Bacteria are simple organisms, with very few genes. To hang onto their antibiotic resistance they have to give up other biologically important tasks, like digesting certain nutrients. Would it be ethical to enact laws denying those vaccine-enthusiast individuals and their children the right to use antibiotics, unless the vaccine-concerned segment of the population approved? Even if it was, this would not be an even trade. Their demand for mandatory vaccinations and my no-antibiotic counter scenario are not equally balanced. Antibiotic resistance has far greater health costs, including illness, disability and death, than vaccine-related diseases. My counterexample is also relevant because the most likely cause of death from measles is pneumonia. Some fear-mongering authorities heightened the fear factor by speculating that measles pneumonia will be even worse now than in the past, because of antibiotic resistance. People who are cautious about vaccines are also cautious about over using antibiotics. It is reasonable to assume that the children of those who are stridently pushing vaccination as a public safety mandate are the children most at risk of antibacterial drug resistance. Their mistaken abuse of antibiotics should increase their fear of the complications of measles because their risk is greater. Some people have strong feelings about their health care options. Most often, parents who do not follow the “party line” with vaccinations are better educated than those who do. Their contrarian decisions are not impulsive. Some of us, studying the facts or considering our individual health concerns, reach different conclusions. I have many families in my practice who have chosen not to vaccinate after one of their children had a bad reaction to a vaccine. Rare problems, like the sometimes lethal paralytic disease Guillain-Barré syndrome, are mysteriously connected to some vaccinations. As my grandfather died of Guillain-Barré, wouldn’t it be irresponsible for me not to think carefully about vaccinations in my family? Doctors and parents are pretty much in the same boat. With the best of intentions we can’t keep our children or our patients safe from all harm. We are both easily overwhelmed by fear – parents because their children mean the world to them and doctors because we have seen even minor problems become lethal. As a medical student I took care of previously healthy twins who died from mono. You might not know that little children, like these girls, almost invariably catch mono without anyone realizing that they did, because the symptoms are so mild. The twins had a rare immune weakness. Precisely like that example, I could tell you story after nightmare story of trivial illnesses or incidents leading to horrible results. Such experiences lead physicians to do too much sometimes, including too many medications and tests. When we do that, the consequences are often worse than just prescribing expensive and needless medications or tests. Our interventions can, and often do, cause harm. There are consequences on either side. Walking that line, between jumping in and sitting back, is the art of clinical practice. That’s what I do every day. I have the weight of decades of experience and the life stories of thousands of patients helping me find the right balance. Parents don’t have that. As a physician utilizing alternative therapies, I have always seen patients who are skeptical of conventions. Of course, my own skepticism is the reason why I practice as I do. Despite my identity as the “go-to” physician for patients critical of vaccines and conventional medicine, over the years I have seen very few patients whose health suffered long-term harm due to vaccinations. I am still concerned about vaccinations, but more about the number of vaccinations than I am about any one particular immunization. There just isn’t the evidence to spotlight a certain vaccine as “the bad one”. My strategy has always been selective immunization, recommending the best vaccination, while considering the individual susceptibilities of each patient. Reducing the total number of vaccinations and administering those most important to a certain child improves the balance of risk versus benefits. For example, it is hard to make a compelling case for certain vaccinations (like rotavirus and rubella for infants). In other instances the balance of risk versus benefit is clear (e.g., tetanus). In still others, the child’s health suggests that a certain vaccine might be unusually important (e.g., whooping cough in an asthmatic child). The timing is also important. For example, a young woman planning a pregnancy who is not immune to rubella should consider that vaccination. When someone in the household is a hepatitis B carrier, that vaccine is very important for an infant. If not, it is better to delay a hepatitis B vaccine until the child might be exposed (typically when he/she becomes sexually active). As we are always learning something new, 15 years from now the vaccine will almost certainly be better. One more point about timing. If you vaccinate your child for measles it will take about 3 weeks for the child’s antibody levels (the anti-measles immune factors) to rise. Measles is nasty enough to justify trying to prevent it. The measles vaccine is relatively effective. It rarely causes serious consequences. It often causes minor and temporary adverse reactions. It is possible that it creates more problems than we know. If a girl gets measles, her milk will protect her infant children. I respect every parent’s responsibility to her/his children and the right to make their own choices as they see fit. Weighing all the considerations, I can understand making either choice. No matter what your ultimate decision is though, please think about it. Don’t make panicked decisions. Block out the Medical Madness.